Chris had some friends over the other weekend and told me that he was craving a breakfast that had tater tots in it (since, let's be honest, tater tots make everything better). The first thing that came to my head was a play off of my Sausage and Hash Brown Bake and a random recipe I had seen floating around on Pinterest. This bake was seriously mouthwatering and all the guys devoured it. 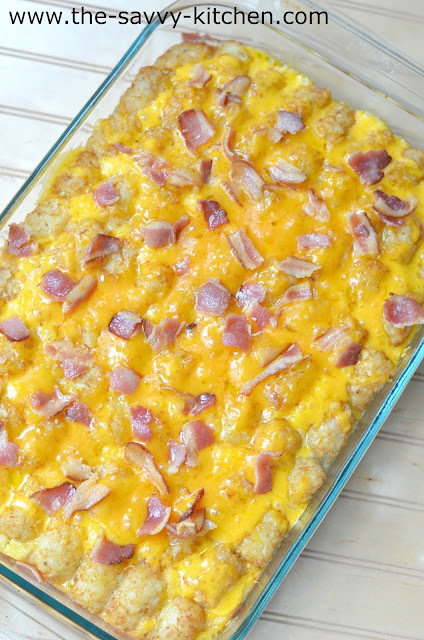 This definitely might be my new favorite breakfast bake. Enjoy! Preheat oven to 350 degrees F. Spray a 9x13" baking dish with cooking spray and set aside. In a large skillet, cook sausage on medium high heat, making sure to break it up as it cooks. Once browned, drain and layer on the bottom of the prepared baking dish. Sprinkle 2 cups of the Cheddar cheese evenly over the sausage. In a large bowl, whisk the Bisquick, milk, eggs, pepper, onion powder and salt. Once mixed, pour evenly over the cheese and sausage in baking dish. Layer the tater tops in even layers on the top. Bake for 40-45 minutes or until set. 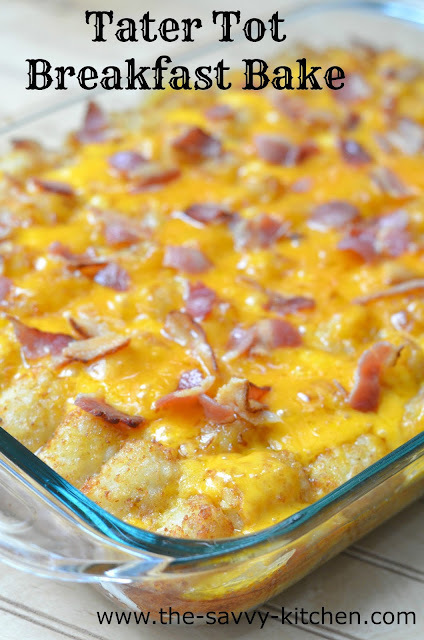 Remove from oven and top with remaining 1 cup Cheddar cheese and bacon pieces. Return to oven and cook an additional 5 minutes or until cheese is melted. That looks great! I love that it doesn't have any soup in it. They are really hard to find gluten free, and i need that. Love it!